In our last blog post, we set out a step-by-step method for identifying VIP customers, and discussed why these online shoppers are so important to your success. This post will go a step further, exploring how you should treat those VIPs in order to keep them close and maximise their revenue potential. Just to recap, the qualification criteria for being a VIP customer are not a) that they have 1.1M followers on Instagram or b) once went on a date with Prince Harry (...although the latter would be pretty cool). No, they’re important because of their personal relationship with your brand - that they've invested their time - and most importantly, their cash - with you. It goes without saying that VIP customers should be treated differently to your other customer segments. 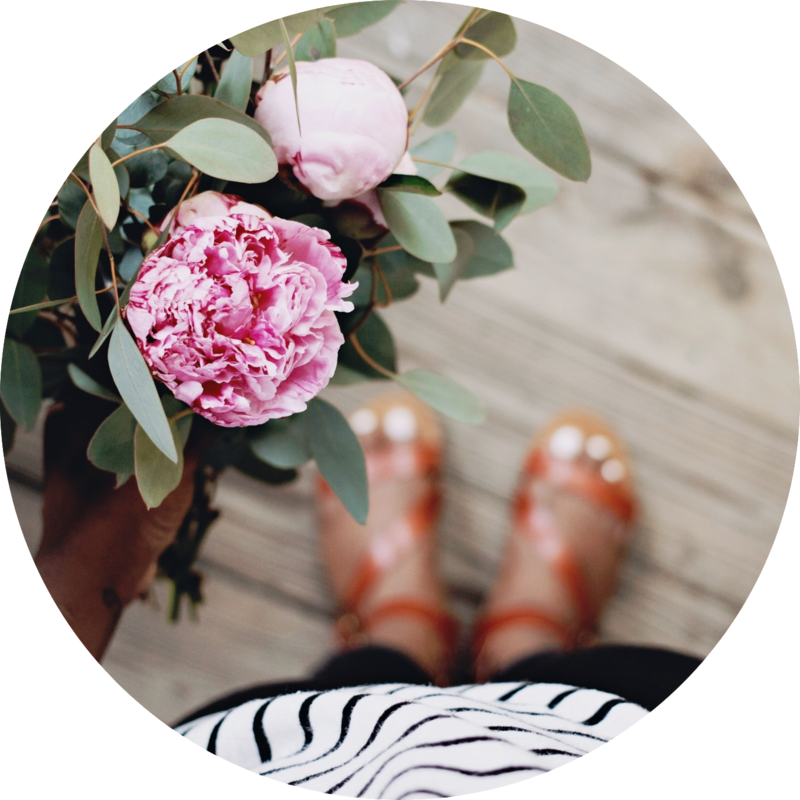 From sending beautifully wrapped gifts in the post to offering early access to an imminent online sale, listed below are tried and tested tactics you can use for your VIP programme. It’s worth noting different brands will have different VIP programmes depending on their business model. For example, a high-end luxury brand might adopt a very different approach to a high-street chain. 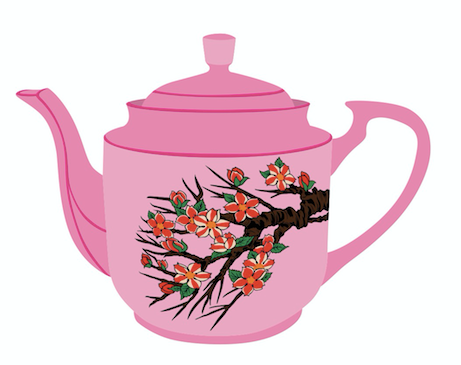 As a loyal follower of our blog, would you like a cup of Earl Grey whilst you read...? You’d be forgiven for thinking that offering your VIP customers amazing discounts is one of the most obvious ways of encouraging them to keep shopping with your brand. Actually, discounts are unlikely to be all that effective with this segment of your customer base. Why? To put it bluntly, if they regularly pay full price ordering from you, money is unlikely to be a huge deciding factor for them - so you're just eating into your margins. Email marketing provides a great opportunity to give your VIPs the special treatment. 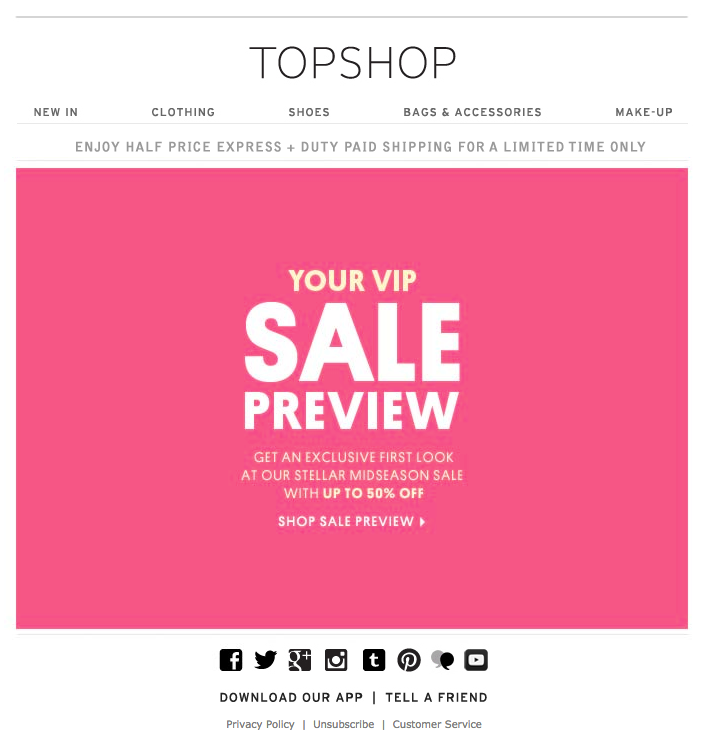 Many brands choose to target the VIP segment with special offers using tactical email blasts. When it comes to adding the VIP touch to these emails, it's all about getting the tone right. In the Topshop and Baublebar emails below, which offers VIPs early access to the sale, recipients are left in little doubt that they're valued and being rewarded for their loyalty. Creating an entirely new VIP version of each of your newsletters is probably unfeasible for most ecommerce marketers. So should they resign themselves to treating VIPs the same as everyone else? Creating an offer banner in an email that changes the offer depending on customer status. That way, you can offer your VIP perks like free delivery even if you're offering money off to other customers. Promoting an exclusive event to VIPs, but displaying other content for non-VIPs. Creating VIP-related visuals to give your best customers a differentiated experience. "But," we hear you ask, "what about automated messages? Where do they come into it?" Turning triggered emails like cart and browse abandonment messages off for your VIP category altogether (since they're likely to be loyal customers anyway). Changing the wording in the triggered messages for your VIP category to acknowledge their status. 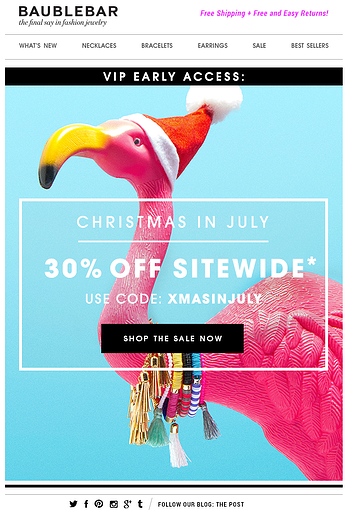 Excluding discount incentives in triggered emails (e.g. abandoned basket) sent to active VIP customers. As touched upon earlier, the main focus of a VIP programme is rewarding a customer, rather than offering them discounts. 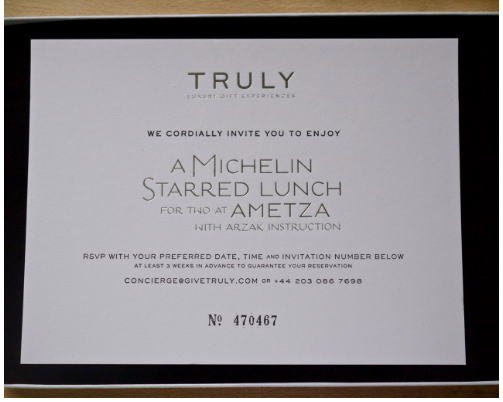 Closely linked to rewards, there’s plenty you can do for your VIPs by way of direct marketing. This doesn’t have to be extravagant; serenading your customer outside their house on the morning of their birthday is likely to send them running for the hills. It’s the little, subtle, albeit thoughtful things that go a long way. Need some inspiration? Think handwritten notes popped into the packaging of online orders to say thank you; bespoke and nicely designed (i.e. not boring and ugly) birthday cards sent via post; little gifts that you know from your data they’re sure to like; a postcard from your store in Paris; a Christmas card signed by the whole team. Using your data, think hard about what they might like and start creating it. It’ll be worth it. It may be that your VIP category is so varied you need to segment it into, for example, top spenders (e.g. top 20%), VIP (top 5%) and elite VIP (top 1%). Consequently, you may wish to apply certain tactics to some groups, but not others. For example, your brand may wish to offer its very best customers a personal shopping advisor. Offering a service like this usually starts with a phone call or email - it’s all about connecting one-to-one opposed to pinging over automated messages. Once you’ve established contact with your VIP, you can start a rapport that will guide them from browsing to buying. Essentially, you will be their personal shopping advisor - offering advice, tips and help along the way. If your brand allows it, you can even process orders over the phone, to make life for your favourite customers that little bit easier. This level of customer service is likely to go a long way with customers of an older demographic, who do not feel comfortable shopping online, and customers with a very busy schedule and do not necessarily have the time to browse your website. We hope that this blog post has demonstrated to you the importance of treating your VIP customers like VIP customers. Forget your mother’s advice to “treat ‘em mean keep ‘em keen”. Ecommerce marketing is not the same as dating. You need to treat your customers wonderfully and keep them close. Ultimately, you need to go the extra mile. Invest that little bit more time in them than they would expect. It's all about the details.